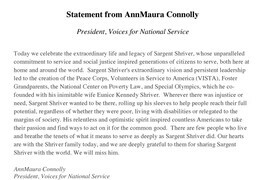 Today we celebrate the extraordinary life and legacy of Sargent Shriver, whose unparalleled commitment to service and social justice inspired generations of citizens to serve, both here at home and around the world. 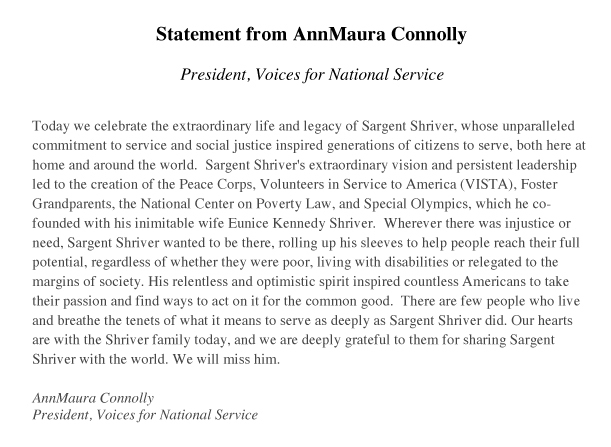 Sargent Shriver's extraordinary vision and persistent leadership led to the creation of the Peace Corps, Volunteers in Service to America (VISTA), Foster Grandparents, the National Center on Poverty Law, and Special Olympics, which he co-founded with his inimitable wife Eunice Kennedy Shriver. Wherever there was injustice or need, Sargent Shriver wanted to be there, rolling up his sleeves to help people reach their full potential, regardless of whether they were poor, living with disabilities or relegated to the margins of society. His relentless and optimistic spirit inspired countless Americans to take their passion and find ways to act on it for the common good. There are few people who live and breathe the tenets of what it means to serve as deeply as Sargent Shriver did. Our hearts are with the Shriver family today, and we are deeply grateful to them for sharing Sargent Shriver with the world. We will miss him.